When I was really little, one of the things that I look forward to is to times when our over-the-road neighbour, Bude (Aunty), ask me whether I want to go to the market with her. The market is only 15 minutes walk from the house, or 2 minutes on the mikrolet (blue, people carrier van, local transportation). I would then follow her first to the dry goods stall, then around to the vegetables stall and finally it is the meat or fish place. 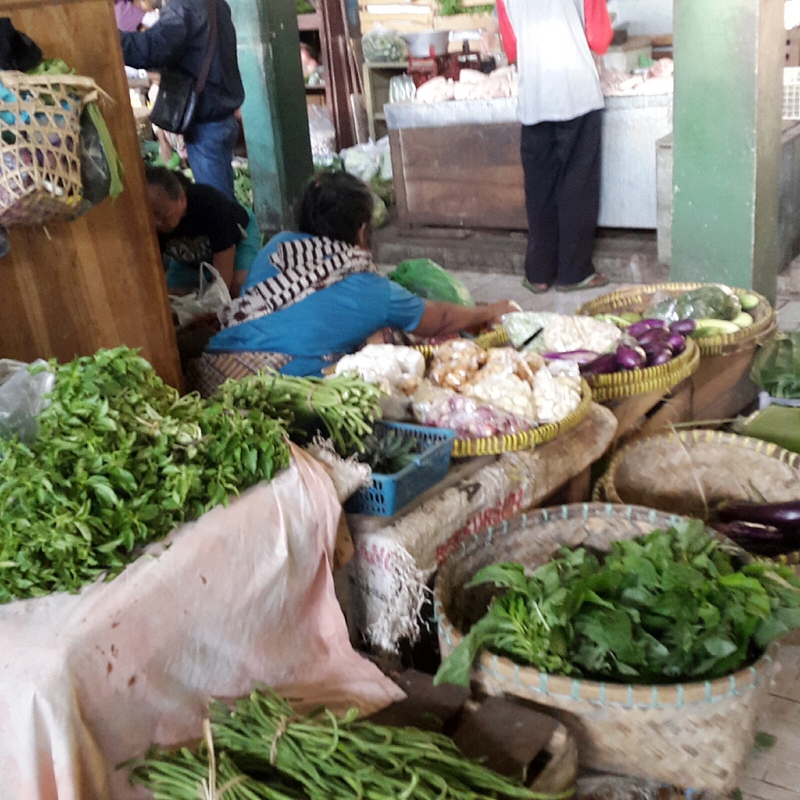 She had her ‘favourite’ stalls, the stall owners would know exactly what she would be looking for, they sometimes offer some suggestions what is the freshest, came this morning from Pasar Minggu. My Bude will choose and inspect the best out of them. When I asked how does she know, she showed me the things I should look for, as to me unless they look rotten, they all look the same. 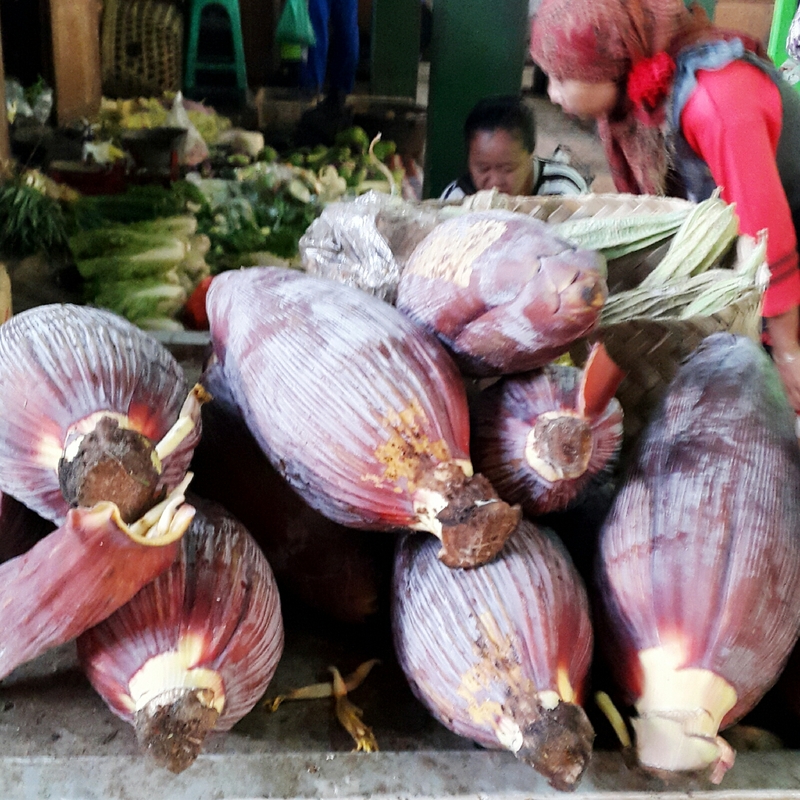 Can you tell which one is the best banana flower? During her inspection, she and the stall owner would exchange stories, sometimes the newest gossip or about their family. In the beginning they asked whose child I was, Bude would say the daughter from the big house across the road her mother works in an office. After a couple of times they stopped asking and know that Bude is looking after me. Sometimes before we go back, she buys me extra traditional cake, usually it is my other favourite a hot Kue Ape, it is Jakartan style pancake with soft pandan middle and crispy sides. Yumm. We would usually then take the angkot or Andong (horse and carriage) back. Yes, when I was little there were still horse and carriage in the corners of Jakarta. 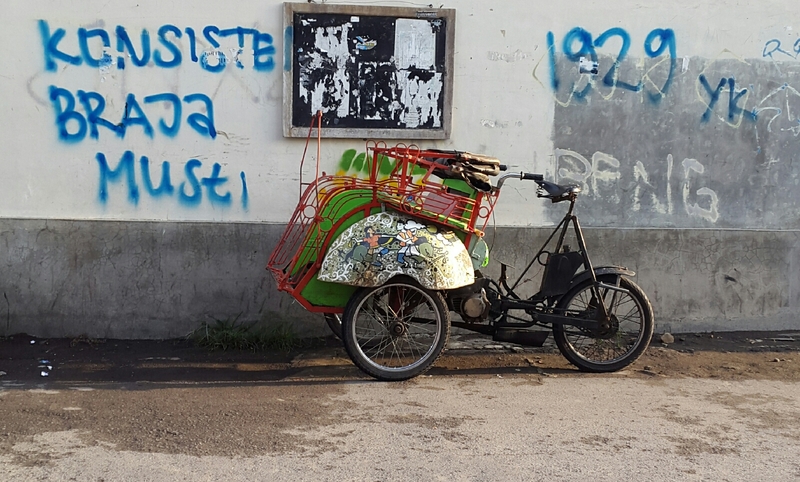 In Jogja today, you can still get a becak (rickshaw) like this, although nowadays there are some motorised rickshaw. 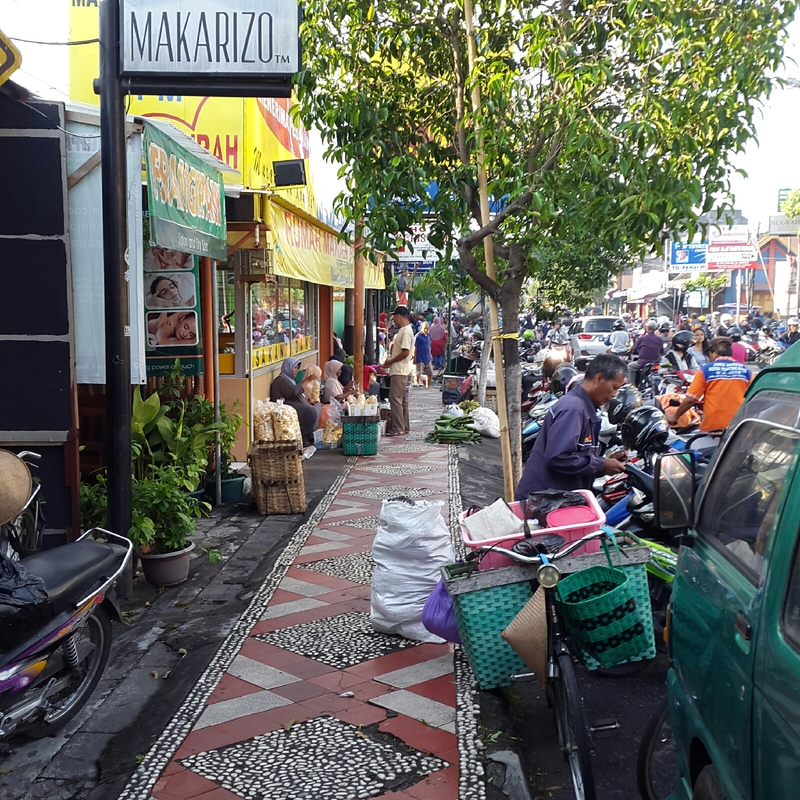 I love going to markets even now, seeing fresh food ingredient, the variety of things that people sell, the vibrant colours and the buzyness of Indonesian market is very attractive. Of course the opportunity to buy yummy traditional food is a big bonus. 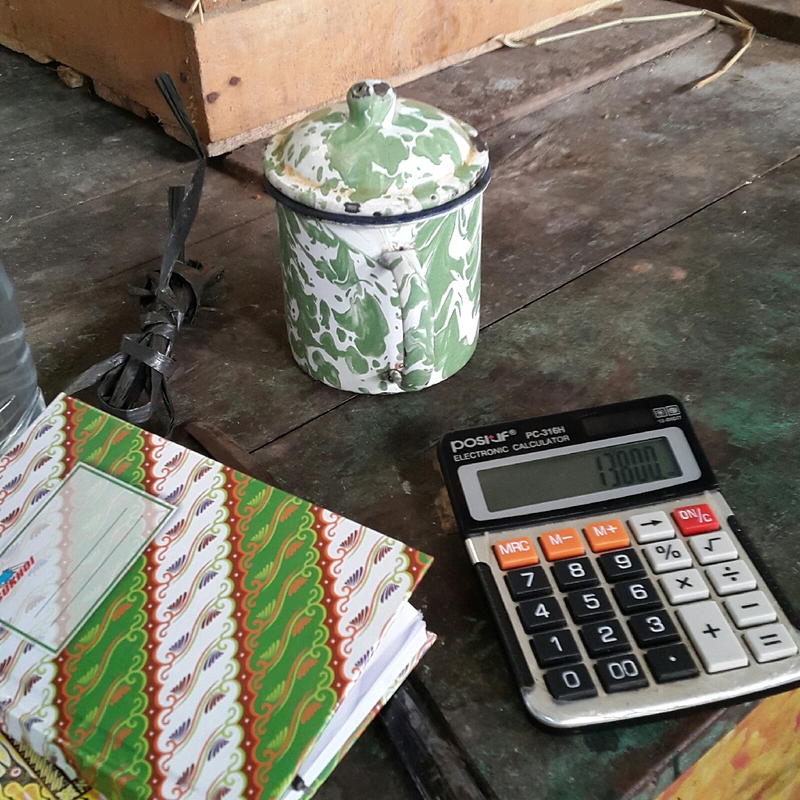 These are some snaps I took when I visited a market in Jogja. What do you think of markets? Do you like markets? If so what do you like about them? Pasar tradisional memang ngangeinin. Gambar yang becak bagus…..suka. Suka juga yah? Mari high five! what a precious Bude you had. 🙂 i hope you haven’t lost contact with her. i think whenever i went to markets, i would end up looking for knick knacks for sewing, or clothes. haha, some things never change. and of course, like you said, the snacks! 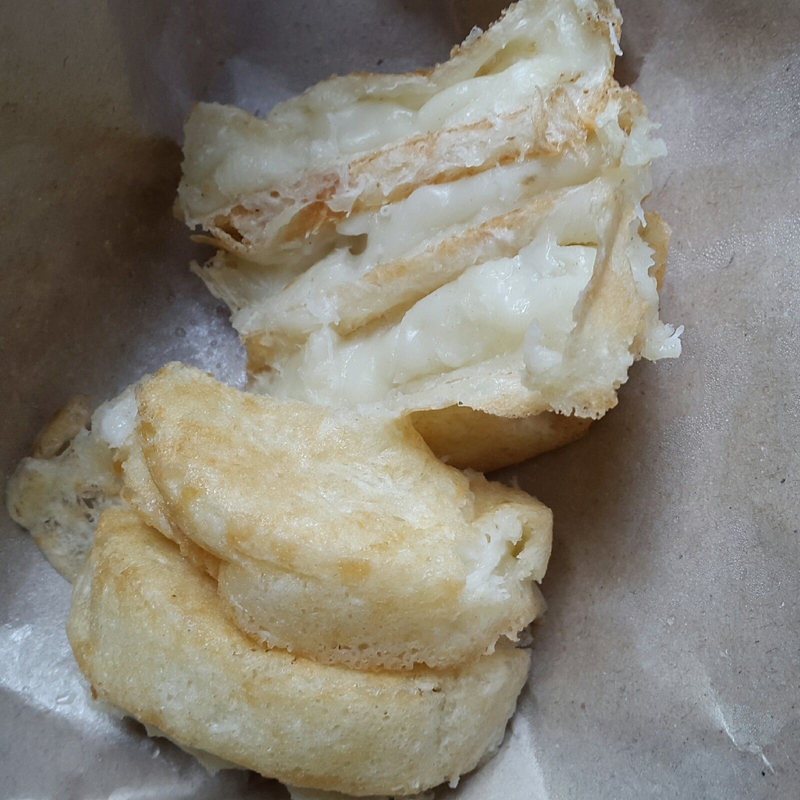 kue ape (i called them kue topi) and arum manis (the cotton candy sandwich with crackers, lol) were always my fave. I haven’t actually visited her for awhile. My mum said that she is really strong. The market near my house was a small one, so it only had 2 shops that sells sewing and clothes. I went to school with the owner’s daughter later I found out. Arum manis, yeah my mum loved those more than I do. There is a rude name for the kue topi. Hihihi. Iya, ibuku tuh yang gak suka aku dibawa ketempat becek. Hahaha. Ibuku malah hampir gak pernah ke pasar waktu itu. Memang terkadang bau tapi aku suka bau ikan asin… maklum ‘anak pasar’.Getuuk yummy, tapi budeku tug jago bikin getuk, jadi gak pernah belii. Ooo traditional markets are so much fun! My mum’s usual market is Pasar Pathuk (yess near the famous bakpia pathuk). There so many goodies there, bubur candil, nasi kuning, lots and lots of snacks, sate babi nyam nyam…. My mum also has her “people”, like to buy chicken, she would call the person who sells it at 5am and comes and picks it up at 6am (yawn so early!). I think traditional markets have its own charm and it’s a whole community inside! Pasar Pathuk is cleaner I think than other markets in town and their produce is also good, I guess when you have your “langganan”, most of the time they will show you their best products. Love this post! Wah, maaf loh ini komen2 kamu baru kelihatan gak muncul di app2ku. Wah ke pasar Pathuk kayaknya seruuu. Was bottom right banana flower the best one? Yeah, I my mum worked so never had the chance to go to a market. Here the market food are more expensive than those from the supermarket, so only go to markets when I am abroad. Broncong? That is interesting. I don’t actually know which one is the best flower, hahahah. I was just trying to proof no one can differentiate them, but you obviously can. Bravooo! !